A reclaimed, rustic, wrought iron or steel and wooden garden bench. The bench has attractive scrolling arm rests and metal feet with slatted wooden seat and back rest. The bench has a rustic, weathered look with much character. The bench is reclaimed and therefore has some signs of wear. The bench does have weathering, patina, tarnish and surface rust to the metal. The wood has some weakness, moss and signs of outdoor use. The back rest has some hairline cracks and there is a large wood knot with some splintering of the wood around it. The bench may require the seat and back rest replacing by purchaser. 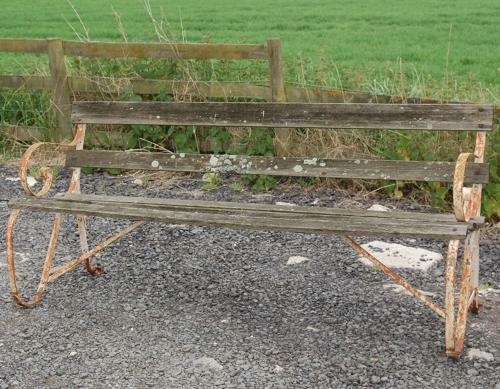 The bench has a lovely, rustic, appearance and would be ideal for a cottage or country garden.